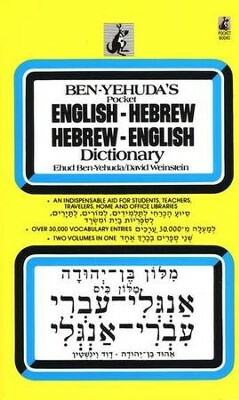 Ben-Yehuda's Pocket English-Hebrew, Hebrew-English Dictionary derives from the eight-volume Dictionary and Thesaurus of the Hebrew Language by Eliezer Ben-Yehuda, the father of modern Hebrew, and from new sudies by his son, Ehud Ben-Yehuda, and David Weinstein. This new work is designed expressly for the widest possible variety of interests and professions for students, teachers, travelers, home and office libraries. In it you will find over 30,000 vocabulary entries, alphabetically arranged. There is a comprehensive but compact explanation of grammar, including tables of irregular verbs. There are keys to proper pronunciation, abbreviations, up-to-date technical terms. examples of idiomatic usage, tables of numerals, weights, measures and currency. 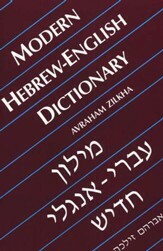 Ben-Yehuda's POCKET ENGLISH-HEBREW, HEBREW-ENGLISH DICTIONARY derives from the eight-volume DICTIONARY AND THESAURUS OF THE HEBREW LANGUAGE by Eliezer Ben-Yehuda, the father of modern Hebrew, and from the new studies by his son, Ehud Ben-Yehuda, and David Weinstein. This new work is designed expressly for the widest possible variety of interests and professions -- for students, teachers, travelers, home and office libraries. 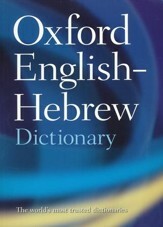 In it you will find over 30,000 vocabulary entries, alphabetically arranged. There is a comprehensive but compact explanation of grammar, including tables of irregular verbs. There are keys to proper pronunciation, abbreviations, up-to-date technical terms, examples of idiomatic usage, tables of numerals, weights, measures and currency. 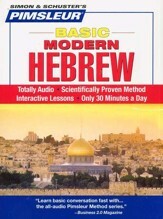 I'm the author/artist and I want to review Ben-Yehuda's Pocket English-Hebrew, Hebrew-English Dictionary.